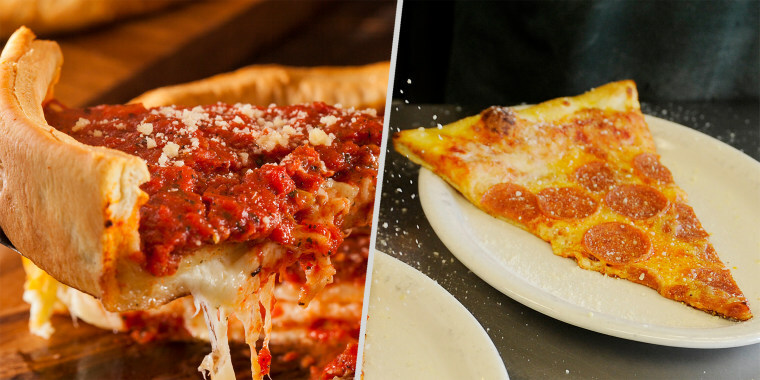 Do you prefer deep-dish pies or a slice with a thin crust? Kooky museums dedicated to ice cream, eggs, avocados and more of America's favorite foods have popped up in various cities over the past few years, but the site of a pizza museum that's opening on Friday is making a lot of people pretty saucy. That's because the U.S. pizza museum will be in — gasp — Chicago, the home of deep-dish pizza. Now, pizza enthusiasts on both sides of the thickness aisle have taken to the Internet with heated comments — and it's hilarious. Fans of New York-style pizza (which has a thin crust and can usually be held by hand) have had a beef with Chicago's deep-dish pie for ages. New Yorkers don't believe that Chicago-style pies (which are often eaten with a fork and knife) should even be called pizza. But of course Chicagoans fiercely defend their hometown's version. Even former U.S. Supreme Court Justice Antonin Scalia weighed in on the debate in 2014 and ruled that deep-dish pizza is not pizza. But even a ruling from someone who was in the highest court in the land couldn't quell the controversy. The opening of the food museum in Chicago is refueling the pizza feud. New York pizza lovers took to Twitter and went berserk about the news that their city wouldn't be the host of the new 3,000-square-foot pizza museum that will "tell the full story of pizza and its U.S. makers," according to The Chicago Tribune. The deep-dish pizza detractors further insulted the food by calling it "tomato bisque, "lasagna" and "a doughy, watery, cheesy undercooked mess." Several people revived memes of Jon Stewart's best one-liners from his rant against Chicago deep-dish pizza on "The Daily Show" in 2013. But Chicago-style deep-dish pizza lovers held strong, defending their pies. This settles the argument now, right? Chicago style is better than New York style. Some people expressed that they were conflicted and unsure whether New York or Chicago pizza had their true allegiance. A couple of people chimed in and said that the museum should open in New Haven, Connecticut, the home of Frank Pepe Pizzeria Napoletana, which has a big cult following. One person made a really interesting suggestion, advising New Yorkers and Chicagoans to put aside their differences and focus their efforts on a pie that may be a true crime against pizza. Many mocked the idea of a museum devoted to pizza anyway and suggested some other ridiculous items that deserve their own museums, including salad and snow. That’s cool. Are we also building the Museum of Snow in Miami and the Museum of Sushi in Oklahoma City? Yes, the idea of a pizza museum is pretty silly. But the ongoing New York and Chicago food feud demonstrates just how passionate Americans are about about pizza! In the end, the truth is that all pizza is delicious — and that even when a pizza is bad, it's still pretty good!